“Low-discharge” is the latest craze in rechargeable batteries: old-fashioned rechargeables would discharge over time without even using them. Low-discharge batteries — many of which come pre-charged in the package — hold a charge far longer: weeks, months, up to a year perhaps. They do this at a price: rechargeables are rated by how much juice they store, rated in mAh: 2,900 is the highest number I’ve seen. Low-discharge batteries are rated at around 2,000 mAh, which means they store about a third less power, but they store that power a lot longer. If you use your digital camera every day and always keep a bunch of high-powered batteries charged, low-discharge probably won’t matter and you’ll be able to take a lot more pictures. But if your camera, like mine, sits on the shelf all week and you take it out on weekends, you’ll get sick of “low battery” messages resulting from your batteries losing their charge. Perhaps the best-known low-discharge batteries are Eneloops by Sanyo. I put a pair of these in my electric toothbrush and it runs like crazy for days on end; my previous rechargeables would start losing power within days because of their natural tendency to discharge. They’re also great in things like wireless keyboards and mice. The batteries pictured above, however, are from Maha, a company known for supplying high-end rechargeables to professional photographers. They come in packages of four, with a cool carrying case included. 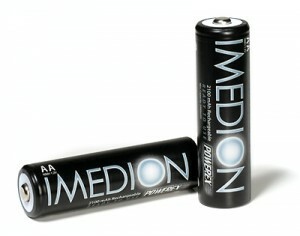 The brand: PowerEx Imedion. A company called Thomas Distributing sells them at a bit of a discount. This page at ConsumerSearch has links to reviews of many of the batteries out there. The Maha batteries are fairly new to market and haven’t been as extensively tested, but I’m thinking they’ll bear up well. Subscribe to comments with RSS or TrackBack to 'About those low-discharge batteries'. It seems that new ones are being made every month. And I thought that I was up to date!